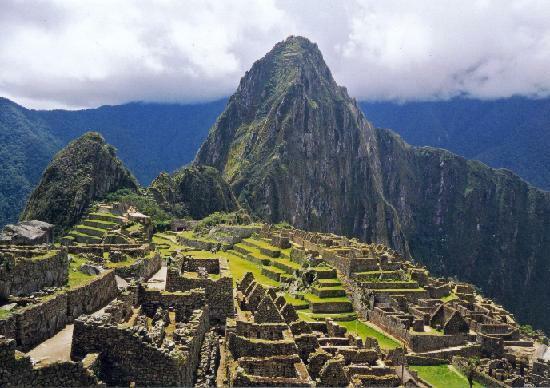 I want to see Machu Picchu and climb to the top. Maybe, if I’m lucky, I’ll be carried up in a litter. Or not. I am a long-time listener/reader of your “new media” endeavors. My husband and I recently returned from a cruise to South America and a trip to Machu Picchu at its end. We flew from Santiago to Cuzco, then took a bus from there to Ollantaytambo Peru. Then we road the scenic train to Augas Calientes. Cuzco is about 12,000 feet above sea level, so we had a few problems with the altitude. Machu Picchu is located at about 9000 ft. The scenery was spectacular and Machu Picchu is amazing. Unfortunately, Peru is a poor country, so the niceties such as a visitor center and museum were missing, but we had a wonderful local guide who taught us a lot about the area. I highly recommed a trip to Machu Picchu and we hope to visit there again. Thanks Pat. I surely hope to be able to visit some day. It looks absolutely majestic. That would be pretty amazing! Nice choice.